WCU/15 : Programmable WELD Time and Cool Time in a schedule. Easy to program with UP/DOWN and ENTER keys. Values programmed are indicated by a two-digit LED display. Individual operations within a weld schedule indicated by LEDs. Key lock switch provided for SET and RUN mode. Timings settable in terms of HALF / FULL cycles of mains supply frequency to achieve better resolution. Half cycle =10msec / cycle for 50Hz supply. OR Full cycle = 20msec / cycle for 50Hz supply. 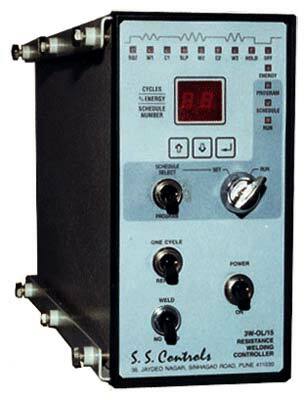 Precise time and energy control ensures consistent weld quality. ONE CYCLE and REPEAT CYCLE mode selectable by toggle switch. WELD / NO WELD switch provided on the front panel. Two weld schedules Externally Selectable by Two Foot Switches. This features is suitable for spot welding Guns and multispot welding machines. Dual Gun operation option available. Output : Gate- Cathode Drive signal to drive a pair of back to Back thyristors of any capacity. Built in back to back thyristors for up to 95A primary current. Normally Open Relay contacts for Solenoid valves. 2 Footswitch, 2 Valve operation suitable for Spot Welding Guns. Two different schedules selectable by independent footswitches. Option available for drive signal for two pairs of thyristors and two solenoid valves. Note: 'Forge Delay' and 'Multi-Spot' options available on request. Precision Control of Resistance Spot Welding Machines of any capacity 0.1kVA to 300kVA. Precision Control of Resistance Spot Welding Guns / Dual Guns etc. Retrofitting controls for any make / any capacity spot welders.